Do we watch alot of television? Do I really have to admit that? I know that my answer should be, "No, we only watch television at specific times during the day. We do not sit and just watch television." Is that the answer I should give the doctors or TV police? We do admittedly watch a lot of television. Joe and I used to watch a massive amount of evening drama and crime shows, but we have gotten better. We have discovered the "Educational" channels and watch a lot of documentary television now. And I do admittedly use a lot of videos and television shows for school also. I have found some really nice series that go great for science and history topics that we are studying. Apparently seeing it on TV makes it so much more believable than me just telling them. 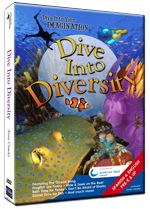 We recently have been learning more about the ocean, so I was pretty excited about getting the opportunity to review a Dive into Your Imagination product called the Dive Into Diversity DVD about ocean life. Dive Into Your Imagination was started by Annie Crawley, A.K.A Ocean Annie. With her experience as an underwater cinematographer and scuba diving instructor, and her passion for our environment and ocean, Ocean Annie gives us a fabulous ocean education! “Dive Into Diversity” teaches children about all the variety of life under the sea and how animals rely upon one another for survival. Take a ride to a depth of 1500 feet in the deep sea with a submarine pilot! Find out what happens on the reef at NIGHT. Learn what eating ice cream and brushing your teeth have in common. Why do crabs have claws? What can grow three feet in just one day? Ocean Annie takes children on a journey to an area that they hear about, but do not get it visit. It is really like being underwater. And on our TV it was like being under the ocean. Our DVD featured the Ocean Song, Crusty Crustaceans, Night Diving, Coral Reef Living, Be a Submarine Pilot, Swim in a Kelp Forest, Sea Animals with Backbones, Diversity, and Invertebrates of the Sea. Their website offers a fun kids section, that includes coloring pages. Joey did not enjoy the music as much as the rest of us. He felt the music was a bit young for him. The girls both enjoyed the whole movie, including the music. It fit in very well with our study of the ocean. It had lots of facts, but not "boring" the way the kids feel that History Channels shows can be. This wonderful DVD had soothing music and lots of great facts. Even my husband stopped and watched it for a while and said he heard something he didn't know. I would also consider this a great choice for one of those "movie" afternoons or even when you just want to put in something educational. It's produced with ages of Preschool children and up. Included in our review, we were also given the PDF study guides that go along with the DVD we received. These guides were packed full of information. They are full of lesson plans, discussion questions as well as coloring and activity pages. They also offer some other beautiful forms of imagery in DVD form. Check out what other crew members have thought about Dive into your Imagination. *****Disclaimer......I received Dive into Diversity free of charge for the sole purpose of this review. I was not required to write a positive review. The views I have expressed are my own and are real experiences with my family. I am disclosing this is accordance with the Federal Trade Commission's 16 CFR, Part 255 http://www.access.gpo.gov/nara/cfr/waisidx_03/16cfr255_03.html>:"Guides Concerning the Use of Endorsements and Testimonials in Advertising."